Your day-by-day itinerary now includes Elk Island National Park, Old Strathcona and Fort Edmonton Park. On the 6th (Mon), browse the different shops at West Edmonton Mall, find something for the whole family at Fort Edmonton Park, then take a stroll through Old Strathcona, and finally explore the wealth of natural beauty at Elk Island National Park. To see other places to visit, where to stay, photos, and other tourist information, read our Edmonton online road trip planner . Toronto to Edmonton is an approximately 7-hour flight. You can also do a combination of bus and flight; or drive. The time zone difference moving from Eastern Standard Time to Mountain Standard Time is minus 2 hours. Traveling from Toronto in May, expect a bit cooler with lows of 7°C in Edmonton. Finish your sightseeing early on the 7th (Tue) to allow enough time to travel to Saskatoon. 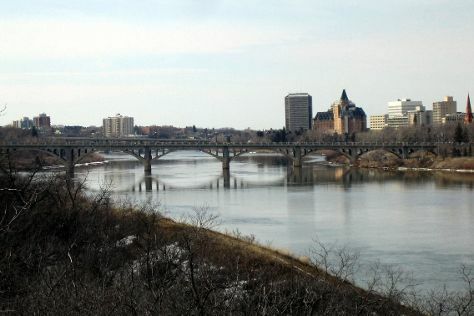 Saskatchewan's largest city, Saskatoon remains compact and manageable enough for easy exploration on foot or by bicycle. Meewasin Valley has been added to your itinerary. For where to stay, maps, more things to do, and more tourist information, go to the Saskatoon trip builder website . Traveling by flight from Edmonton to Saskatoon takes 4 hours. Alternatively, you can drive; or take a train. The time zone difference moving from Mountain Standard Time (MST) to Central Standard Time (CST) is 1 hour. Expect a daytime high around 22°C in May, and nighttime lows around 4°C. On the 7th (Tue), wrap the sightseeing up by early afternoon so you can drive to Moose Jaw. Moose Jaw is a city in south-central Saskatchewan, Canada, on the Moose Jaw River. For maps, reviews, photos, and other tourist information, refer to the Moose Jaw trip builder . Getting from Saskatoon to Moose Jaw by car takes about 3.5 hours. Other options: take a bus. In May, plan for daily highs up to 22°C, and evening lows to 3°C. Finish your sightseeing early on the 8th (Wed) so you can drive to Medicine Hat. Medicine Hat is a city in southeast Alberta, Canada. Your day-by-day itinerary now includes Saamis Tepee as well as Medicine Hat Farmers' Market. Plan a trip to Medicine Hat easily and quickly by telling Inspirock to suggest an itinerary. You can drive from Moose Jaw to Medicine Hat in 4.5 hours. Alternatively, you can take a bus; or do a combination of bus and flight. Due to the time zone difference, you'll gain 1 hour traveling from Moose Jaw to Medicine Hat. In May, daytime highs in Medicine Hat are 22°C, while nighttime lows are 5°C. Wrap up your sightseeing by early afternoon on the 8th (Wed) to allow enough time to travel to Patricia. Your day-by-day itinerary now includes Dinosaur Provincial Park. To find ratings, other places to visit, photos, and more tourist information, refer to the Patricia tour itinerary planner. Traveling by car from Medicine Hat to Patricia takes 1.5 hours. May in Patricia sees daily highs of 22°C and lows of 3°C at night. Wrap up your sightseeing on the 8th (Wed) early enough to travel to Calgary. For more things to do, reviews, where to stay, and other tourist information, read our Calgary trip planner. Getting from Patricia to Calgary by car takes about 2.5 hours. When traveling from Patricia in May, plan for a bit cooler days and about the same nights in Calgary: temperatures range from 19°C by day to 3°C at night. On the 9th (Thu), you'll have the morning to explore before heading off to Banff National Park. Your day-by-day itinerary now includes Banff Gondola as well as Cave and Basin National Historic Site. Start off your visit on the 9th (Thu): catch a ride on Banff Gondola, contemplate the long history of Cave and Basin National Historic Site, then get to know the fascinating history of Fairmont Chateau Lake Louise, and finally explore the striking landscape at Natural Bridge. To see where to stay, more things to do, photos, and other tourist information, refer to the Banff National Park visit planning app . You can drive from Calgary to Banff National Park in 2.5 hours. Alternatively, you can take a bus; or take a shuttle. Prepare for little chillier weather when traveling from Calgary in May: high temperatures in Banff National Park hover around 15°C and lows are around -1°C. Cap off your sightseeing on the 9th (Thu) early enough to go by car to Kelowna. 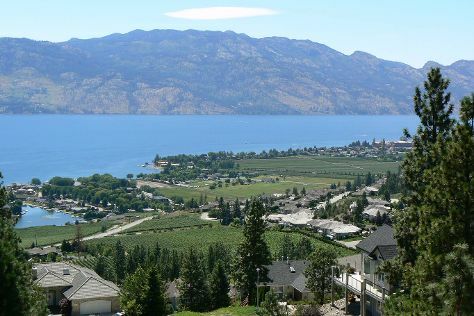 Lake Okanagan has been added to your itinerary. To see maps, traveler tips, ratings, and more tourist information, read our Kelowna route website . You can drive from Banff National Park to Kelowna in 6 hours. Alternatively, you can do a combination of shuttle and flight; or take a bus. The time zone changes from Mountain Standard Time to Pacific Standard Time, which is usually a -1 hour difference. On the 10th (Fri), you'll have the morning to explore before heading off to Tofino. 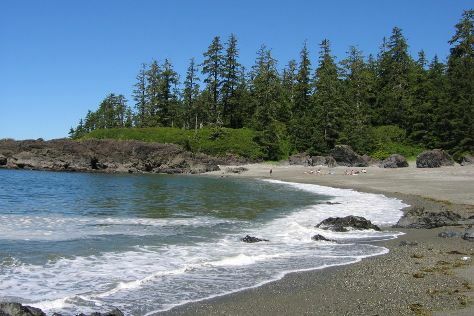 Your day-by-day itinerary now includes Pacific Rim National Park as well as Rainforest Trail. For more things to do, other places to visit, ratings, and more tourist information, use the Tofino day trip planner. Traveling by flight from Kelowna to Tofino takes 5.5 hours. Alternatively, you can do a combination of car and ferry; or do a combination of bus and ferry. In May in Tofino, expect temperatures between 17°C during the day and 9°C at night. You'll have a few hours on the 11th (Sat) to wrap things up before traveling to Nanaimo. Your day-by-day itinerary now includes Ammonite Falls as well as Harbourfront Walkway. On the 12th (Sun), you'll have a packed day of sightseeing: go for a walk through Harbourfront Walkway and then take in the dramatic scenery at Ammonite Falls. To see ratings, where to stay, maps, and tourist information, refer to the Nanaimo tour itinerary planner . You can drive from Tofino to Nanaimo in 3.5 hours. Alternatively, you can take a bus. In May, daytime highs in Nanaimo are 19°C, while nighttime lows are 13°C. You will leave for Vancouver on the 13th (Mon). Your day-by-day itinerary now includes Cypress Provincial Park, Vancouver Seawall and Stanley Park. Find out how to plan Vancouver trip without stress by asking Inspirock to help create an itinerary. Vancouver is just a stone's throw from Nanaimo. May in Vancouver sees daily highs of 21°C and lows of 12°C at night. Wrap up your sightseeing on the 12th (Sun) early enough to travel to Prince George. Prince George, with a population of 74,003, is the largest city in northern British Columbia, Canada, and is the "Northern Capital" of BC. Your day-by-day itinerary now includes Lheidli T'enneh Memorial Park (Fort George Park) as well as Fort George Canyon Provincial Park. To see photos, traveler tips, and other tourist information, read our Prince George visit planning tool . Traveling by flight from Vancouver to Prince George takes 3 hours. Alternatively, you can drive; or take a bus. Traveling from Vancouver in May, Prince George is little chillier at night with lows of 3°C. Finish your sightseeing early on the 13th (Mon) to allow enough time to travel to Stewart. Your day-by-day itinerary now includes Bear Glacier Provincial Park. To see reviews, photos, where to stay, and more tourist information, read Stewart online trip maker . Drive from Prince George to Stewart in 9 hours. Alternatively, you can fly. Traveling from Prince George in May, expect a bit warmer with lows of 8°C in Stewart. Finish up your sightseeing early on the 14th (Tue) so you can travel to Carcross. Carcross, originally known as Caribou Crossing, is an unincorporated community in Yukon, Canada, on Bennett Lake and Nares Lake. 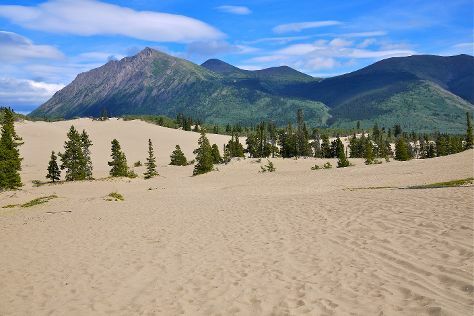 You've now added Carcross Desert to your itinerary. To plan Carcross vacation without wasting time, ask Inspirock to design an itinerary. Getting from Stewart to Carcross by car takes about 14 hours. Other options: fly. Traveling from Stewart in May, expect a bit cooler with lows of 3°C in Carcross. Finish your sightseeing early on the 14th (Tue) so you can travel to Haines Junction. You've now added Kathleen Lake to your itinerary. Quickly create a custom-made itinerary for Haines Junction using our trip planner. Traveling by car from Carcross to Haines Junction takes 2.5 hours. Expect a bit cooler evenings in Haines Junction when traveling from Carcross in May, with lows around 0°C. Finish your sightseeing early on the 15th (Wed) so you can travel to Whitehorse. Surrounded by three distinctive mountains, and perched upon a frigid river, Whitehorse lives up to its reputation as "The Wilderness City." The capital, and indeed only city of Canada's northwest Yukon region has a reputation for its clean air, with one survey ranking it as the city with the lowest air pollution in the world. Your day-by-day itinerary now includes Takhini Hot Springs as well as Miles Canyon. 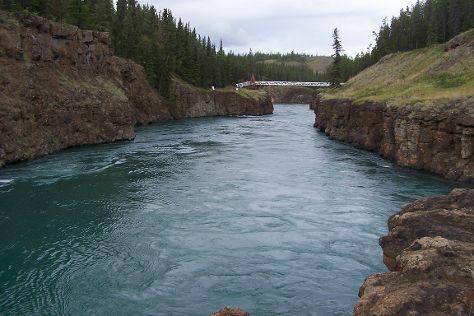 Kick off your visit on the 15th (Wed): appreciate the history behind "The Whitehorse Horse", take in the dramatic natural features at Miles Canyon, and then witness a stunning natural landmark at Takhini Hot Springs. To plan Whitehorse vacation without wasting time, ask Inspirock to design an itinerary. Drive from Haines Junction to Whitehorse in 2 hours. Traveling from Haines Junction in May, expect a bit warmer with lows of 3°C in Whitehorse. On the 16th (Thu), wrap the sightseeing up by early afternoon so you can travel to Dawson City. 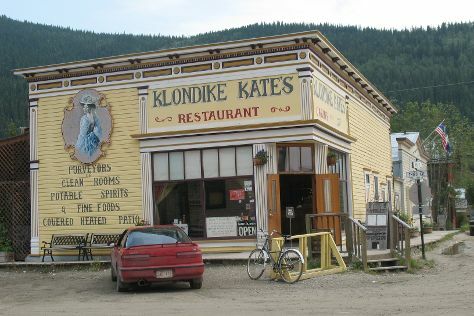 The Town of the City of Dawson, commonly known as Dawson City or Dawson, is a town in Yukon, Canada. On the 16th (Thu), contemplate the long history of Klondike National Historic Site, then contemplate the long history of Bonanza Creek, and then see the interesting displays at Danoja Zho Cultural Centre. To see where to stay, more things to do, other places to visit, and tourist information, read our Dawson City journey planning app . You can fly from Whitehorse to Dawson City in 1.5 hours. Other options are to take a bus; or drive. In May in Dawson City, expect temperatures between 20°C during the day and 1°C at night. You will have some time to spend on the 17th (Fri) before leaving for Liard River. Liard River is a small community in northern British Columbia, Canada. To see maps, traveler tips, and tourist information, read our Liard River trip planner . Getting from Dawson City to Liard River by car takes about 14.5 hours. Other options: fly. Traveling from Dawson City in May, expect nights in Liard River to be about the same, around 5°C, while days are a bit cooler, around 7°C. Cap off your sightseeing on the 18th (Sat) early enough to travel to Wembley. Wembley is a town in northern Alberta, Canada. You've now added Philip J. Currie Dinosaur Museum to your itinerary. To see where to stay, reviews, maps, and tourist information, go to the Wembley road trip planner. Getting from Liard River to Wembley by car takes about 10 hours. Other options: fly. You'll lose 1 hour traveling from Liard River to Wembley due to the time zone difference. Wrap up your sightseeing on the 18th (Sat) to allow time to travel to Grande Prairie. Grande Prairie is a city in northwest Alberta, Canada within the southern portion of an area known as Peace River Country. For ratings, more things to do, other places to visit, and more tourist information, go to the Grande Prairie tour itinerary planning website . Grande Prairie is very close to Wembley. Expect a daytime high around 20°C in May, and nighttime lows around 3°C. Finish your sightseeing early on the 19th (Sun) to allow enough time to travel to Jasper National Park. Your day-by-day itinerary now includes Athabasca Glacier, Spirit Island and Athabasca Falls. On the 21st (Tue), trek along Maligne Canyon, then get a taste of the local shopping with Jasper Artists Guild Brush Fire Gallery, then admire the sheer force of Athabasca Falls, and finally take in the dramatic natural features at Mount Edith Cavell. For maps, more things to do, photos, and more tourist information, read our Jasper National Park journey website . Getting from Grande Prairie to Jasper National Park by car takes about 4.5 hours. Plan for a bit cooler nights when traveling from Grande Prairie in May since evenings lows in Jasper National Park dip to 0°C. Wrap up your sightseeing by early afternoon on the 22nd (Wed) to allow enough time to drive to Edmonton. To see other places to visit, more things to do, ratings, and other tourist information, refer to the Edmonton journey maker . You can drive from Jasper National Park to Edmonton in 4.5 hours. Alternatively, you can take a bus; or take a train. Traveling from Jasper National Park in May, you can expect nighttime temperatures to be somewhat warmer in Edmonton, with lows of 7°C. You will leave for home on the 22nd (Wed).